Metro Phase II work takes off, with KIADB starting the land acquisition process. File pic. 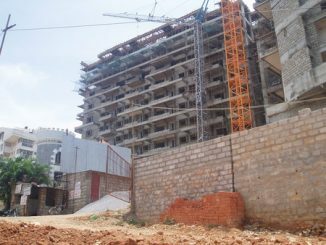 Karnataka Industrial Areas Development Board (KIADB) conducted the first hearing for the owners of properties to be acquired for alignment of Metro Phase II on 4 September, 2013. The properties notified were for Ragigudda and Silk Board stations, on RV Road- Bommasandra line. Metro is all geared up to start the Phase-II work by January 2014. To achieve this target, the process of identification of properties was already initiated by KIADB officers deputed to the Metro, in the last few weeks. In the first hearing, only the properties required for building Ragigudda and Silk Board stations received notification. KIADB issued notifications to 55 properties out of which 10 properties had been awarded by BBMP to poor people, way back in 1980’s. Only 20 owners of properties in question were present at the hearing held at the KIADB office, in Nrupathunga Road. Most of them were concerned over losing their property partially. Most of them were wondering what will they do with the partial land. They wanted BMRCL to take entire land and or compensate them with good amount. “On a blank white sheet of paper, objections have been recorded in an indecipherable handwriting.KIADB land acquisition officers took our signature on it,” says Anand M, Mangala’s husband, who works as a labourer in a private company. Majority of people who attended the hearing were looking for good compensation, as everyone seemed to accept that the project was final and they could not afford to fight it. Residents are looking for the Land Acquisition BILL 2012 to get implemented, in the hope that it might provide some respite to them, as it has been termed as citizen-centric. Process for the land acquisition will follow the terms of KIADB Act-1966 and General Land Acquisition Act-1894. Compensation amount will be decided by the Krishnappa Committee. Krishnappa is a former revenue secretary who is an advisor to BMRCL. All the objections will be taken to BMRCL who will in return file their reasons behind the said acquisition. If the KIADB officer finds it necessary, the properties will be acquired. “99% such objections do not lead to any changes. People are aware of it. It is not an easy task to change the alignment once decided, as it will again be required to go to HPC of the Central government. A compensation very close to market value will be awarded,” said Tirlapu. The land acquisition to be started in April 2013 wasn’t allowed by the Election Commission because of the Code of Conduct. The realignment controversy too contributed to the delay in execution of Phase II. A compilation of articles Citizen Matters has covered on Bangalore metro-construction. The heat generated by citizens’ action contesting BDA’s Koramangala signal free corridor project is as much as the heat to come from the traffic snarls when four junctions here are dug up soon.